Both new 13-inch MacBook Pro models include Nvidia’s GeForce 320M integrated graphics, which shares a minimum of 256MB of main memory. This replaces the GeForce 9400M integrated graphics in the previous generation (which shared the same amount and type of RAM). In our testing, the new 13-inch models achieved much better frame rates on our Call of Duty test. For example, at 38.9 frames per second, the 2.4GHz MacBook Pro did 15.2 frames per second better than the higher-end, 2.53GHz 2009 model—an improvement of 64 percent. They still lagged way behind the new low-end 15-inch MacBook Pro, which garnered 68.4 frames per second thanks to it discrete graphics. The new MacBook Pros have the same Multi-Touch glass trackpad as before, but the line adds a new trick. All of the new MacBook Pros (including the 13-inch models) now have inertial scrolling. Just like on an iPhone, iPod touch, or iPad, swipe your finger down to scroll through a long Web page, for example, and the momentum continues the scrolling until it gradually dies off. The feature seems right at home on the MacBook Pro and will be familiar to anyone who has used Apple’s iPhone OS devices. Although the 15- and 17-inch MacBook Pros include Intel's new Core i5 or Core i7 mobile processors, the 13-inch MacBook Pro continues to use the Core 2 Duo line of processors. In the 13-inch size, Apple offers a 2.4GHz dual-core processor in the $1199 model, and a 2.66GHz dual-core processor in the $1499 model (up from 2.26GHz ( ) and 2.53Ghz ( ) in the previous generation, respectively). Each has 3MB on-chip L2 cache shared between the two cores. 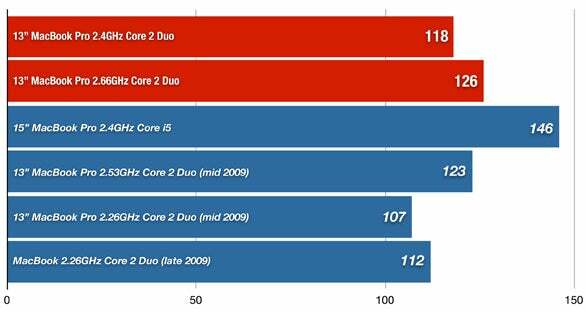 Some users have wondered why Apple decided to stick with Core 2 Duo processors instead of using the new Intel Core i3 in the 13-inch line. Although one could cynically speculate that it’s designed to ‘cripple’ the low-end MacBook Pro with old technology to force people to spend more, it seems more likely that Apple didn’t want to use the Intel HD integrated graphics that such a move would require (the 15- and 17-inch models include Intel HD graphics, but have dedicated Nvidia graphics processors as well). These MacBook Pros use the same LED-backlit 1280-by-800 pixel glossy display as the previous models (there are no antiglare or high-resolution display options, as there are on the 15- and 17-inch models). The displays are very bright, and the viewing angle is respectible in the horizontal direction, but not that great vertically—you really need to adjust the angle of the display to achieve optimum viewing. Longer bars are better. Blue bars in italics represent reference systems. Macworld Lab testing by James Galbraith, Chris Holt, Chris Holt, Lynn La, and Meghann Myers. In our Speedmark 6 suite, the new models scored 118 for the 2.4GHz model and 126 for the 2.66GHz model (compared with 107 and 123 for the previous generation, respectively, and 112 for the MacBook)—the difference due, mostly, to the improved frame rate scores thanks to the Nvidia 320M graphics. If you already have the previous 13-inch MacBook Pro, there’s not a lot of reason to upgrade unless you simply must have the newest version of everything. The changes to the 13-inch lineup are mostly about improved graphics and battery life, and they aren’t all that different from the year before—and it’s somewhat hard to justify the $1499 model based only on its larger hard drive and slightly faster processor, which didn’t translate to much difference in our tests. To get the most from the new generation of MacBook Pros, you’ll need to step up to the larger sizes, which take advantage of the i5 and i7 processors and their own graphics improvements. Still, at 4.5 pounds and less than 9 inches deep, thje 13-inch MacBook Pro is the most portable Pro model available, and for many users the small weight and size make up for the somewhat limited (comparatively) performance.